I created this back around 1990, maybe late 1980’s. It was one of my early attempts at texture mapping. I made the drawing while sitting at my desk as Director of The Advanced Computing Center for The Arts and Design. I was probably pretending to have profound thoughts about basic research. See the mention of myself as Director. Then there is a reference to one of my sponsors the Defense Advanced Research Project Agency. There is the National Institute for Health. 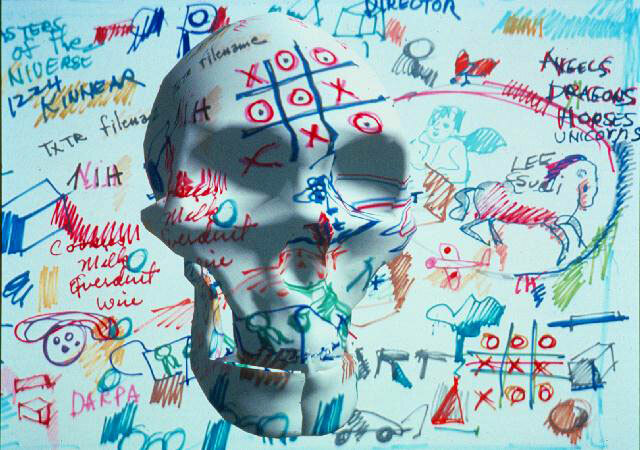 Not that anybody cares but that was the first skull made in computer graphics. I see in the drawing my wife Lee, a sculptor, and her angels, dragons, horses and unicorns. I notice Lee told me to bring home some milk and wine. Playing by myself I did win once at tic tac toe.